Rokka bursts forth with citrus and violet, has middle notes of ancient cedar, tree moss, nutmeg and Tonka bean, then coats the skin with amber and patchouli. We are proud and happy to be donating a portion of the proceeds from each bottle of Rokka sold to the Chill Foundation (Chill.org). 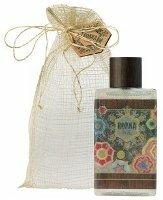 Antonia's Flowers Rokka is available now from the brand's website, in 100 ml (concentration unknown) for $125. That’s a lovely bottle, kind of makes me think of a hippie style. This could actually be really interesting.. I still adore their Tiempe Passate, but haven’t loved any of the rest of it so far. But would give this a shot if I saw it, of course!